In ProAV, the only constant is flux. So what should technology managers and installers do today to meet tomorrow’s needs? And how does the evolving HDBaseT spec reflect changes in the broader AV landscape? These questions drove spirited discussions on Day 2 of the HDBaseT World Congress in Spain. It’s no secret that the ProAV scope is getting wider, partly motivated by trends in the IT world. IT goals related to AV include migrating content to the cloud and virtualizing content. “These are exciting changes but they introduce new challenges,” said Daniel Shwartzberg, director of Customer Experience, HDBaseT Alliance. One of those new challenges is routing AV-over-Cloud to any end node. Another challenge is encryption and DCP compliance. Shwartzberg related the changes in the ProAV industry to HDBaseT’s own evolution. Native ports (HDMI, DVI, VGA) sit close to the switches which means they need extension. “For cost-effectiveness, where you can, connect with your native interfaces,” Shwartzberg said. “If you need to go further, go HDBaseT. If you want to go outside or cross-campus, go IP.” Enter the HDBaseT IP spec and its value proposition. HDBaseT IP also has a certification process which helps streamline interoperability within the ecosystem. Paul Harris, CEO of Aurora Multimedia, used his HDBaseT World Congress address to explore realistic approaches to AV over IP. “There is no one best product,” he explained. From MPEG2, H.264, H.265, JP2000, VC2, 10G, some approaches are good for recording. Some protocols work better for viewing off-site. Other applications call for a hybrid design. Technologies keep improving, but it’s important to remember that solutions have been designed for different use cases. To streamline systems and create efficiencies, he encouraged the HDBaseT World Congress members to offer more education and user training. “Education is key” to bridging the gap between AV and IT. The AV over IP Holy Grail? “Major and minor spec updates have been released over the years,” said Daniel Shwartzberg. The HDBaseT 1.0 and 1.1 specs paved the way for the analog sunset and point-to-point connectivity, but with the need for multipoint systems, the HDBaseT Alliance agreed that a new approach was needed. Spec 2.0 was issued in 2013. The IP Spec was issued in 2017. The evolving technology landscape and resulting use-cases require a new approach to the spec structure. “Everyone at the World Congress is invited to contribute to the future of the spec,” he said. The Alliance is also committed to enabling working in parallel so multiple groups can collaborate simultaneously on independent specifications. Ultimately these initiatives should shorten time to market. Representatives at the World Congress announced that Lattice Semiconductor is bringing a 4:4:4 HDBaseT Solution to production in December 2017. The solution pairs the Valens Colligo chipset with Lattice’s chipsets (SiI9630, a HDMI 2.0 transmitter and SiI9396, a HDMI 2.0 receiver), to deliver HDMI 2.0 4K60 4:4:4 video transmission. The reference design leverages Lattice Semiconductor’s video connectivity to enable UHD video transmission using efficient compression while maintaining latency to negligible microseconds. DSC is a codec chosen by the HDMI Forum and VESA. HDBaseT says this new solution meets the growing need for Ultra HD 4K and HDR support. World Congress representatives devoted a morning session on Day 2 to content protection. They shared that DCP is investigating methods to prevent unauthorized HDCP 2.2 devices in the market. System manufacturers have provided feedback to the latest draft spec. DCP is looking to modify obligations of IC manufacturer when shipping. HDCP 2.3 is on hold, but DCP is on the case. "The intention is to provide pin-compatible, software-compatible ICs. [They are] going back to the drawing board." Learn more about HDBaseT at hdbaset.org. Learn more about Aurora Multimedia’s AV over IP solutions at https://www.auroramultimedia.com. 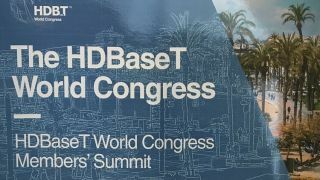 If you missed my Day 1 report, access it here: A World of Possibility: The HDBaseT World Congress Convenes in Spain.